This year's La Ruta Maya is just over 3 weeks away. It starts on March 6th, and ends on National Heroes and Benefactor's Day. Thanks to Island Films(Ben Popik, Joanna Popik, & Marshall Rimmer) for the video. "All teams are advised that registration can be done at Yoli's Pizza located down town San Ignacio in the Welcome Center. Call 633-3138 for any queries regarding registration or 662-4577 for all other queries. Can also email your registration forms to [email protected]"
In the misty early morning light of March 6, 2015, dozens of athletes will gather with their canoes at the Hawkesworth Suspension Bridge on the banks of the Macal River in San Ignacio, Belize. 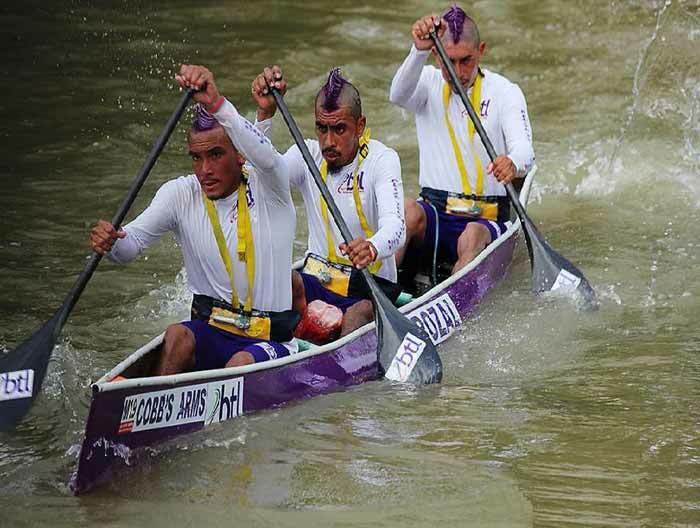 More than 80 canoes are expected to participate in this year's annual La Ruta Maya Belize River Challenge, oared by enthusiasts from around the world. Their objective? To be the first to reach the Belcan Bridge in Belize City, more than 180 miles downriver. The journey takes four days. La Ruta Maya is the biggest annual sporting event in Belize. 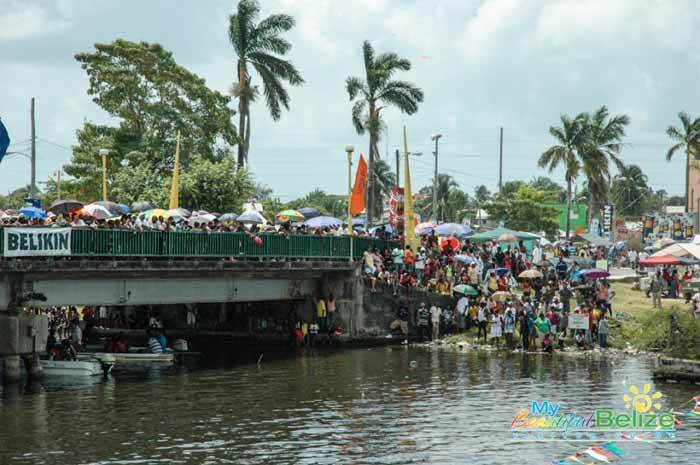 Thousands of spectators line the banks of the Belize River to cheer on their favorite teams. 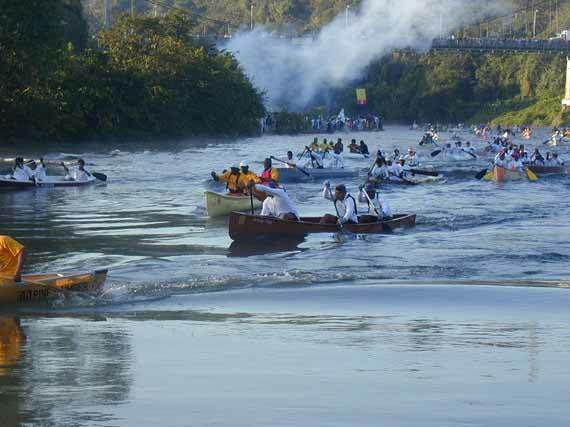 The race has its origins in the 1995 Save Our Rivers Programme, a canoe race intended to promote cleaning up debris in and on the banks of the Old Belize River. This event has evolved to become the annual La Ruta Maya Challenge, a four-day event that follows an ancient Mayan route from San Ignacio to Belize City and is ranked 40th on Peak Races' 100 Toughest Races in the World. Anyone can participate. Teams are rated, from men's professional to mixed youth, for this race that is an opportunity for the diverse population of this country to come together for a four-day weekend on the river. Many follow the race onshore, chasing their favorite teams from Cayo to the Caribbean Sea. Each day, after paddling for hours, the canoe teams come ashore, where they are met by fans at checkpoints in charmingly named local villages, including Banana Bank, Double Head Cabbage, and Burrell Boom. Belize is an entire country that feels like a small town. Never is this more evident than during La Ruta Maya. The scenes at end-of-day village checkpoints are like big family reunions. Campsites are pitched, Belikin beer tents are set-up, local specialties are prepared over open fires, and children run and play, in the river and on its banks. The starting point, San Ignacio, is in Belize's Cayo District, the fastest-growing region in the country. This is the country's eco-adventure hub, with all the elements of a fun and sustainable lifestyle--plenty of fertile land, fresh water, sunshine, and wildlife, all supporting a friendly community of fun-loving Belizeans and expats. You still have time to make plans to join them all for their big annual river party. The most grueling canoe race in Belize is right around the corner, and paddlers are preparing to take on the 17th Annual La Ruta Maya River Challenge. The four-day race is one of the most highly anticipated events of the year, and sees racers traveling the 180-mile river route from the Macal River in the Cayo District to the Belize River in the Belize District. This year’s race will take place from Friday, March 6th to Monday, March 9th and will test participants’ endurance and survival skills. In other words: BEAST MODE ACTIVATED!! La Ruta Maya River Challenge was founded by Richard Harrison of Big-H Enterprises for the purpose of launching Vida brand purified water. It made its official debut on March 9, 1998, and was seen as an opportunity to bring many partners with similar interests together to build an event that could allow for promotional themes of ‘natural products’ identified with sports, endurance, nutrition, and well-being. The underlying concept is one of a team of businesses and organizations interested in the environment/ecology, history/culture and the tourism potential which the Belize Old River offers as one of the great natural resources of the country. 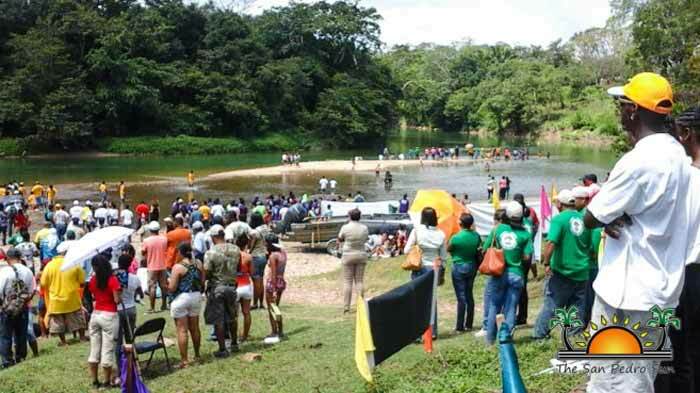 The race kicks off at the foot of the Hawksworth Bridge in the Twin Towns of Santa Elena/Cayo and makes its way to Banana Bank Lodge outside of Belmopan. On the second day, the paddlers continue from Banana Bank Lodge to Double Head Cabbage Village on the Belize River. On day three, racers make their way along the Belize River ending in Burrell Boom Village. On the last day paddlers push through the final stretch from Burrell Boom to the Belchina Bridge in Belize City. Hello! I'm new to these forums and have been living in San Pedro for two months now. I'm really interested in going over for the event, but I'm on a tight budget. Do you have any advice? Is it possible to just bring supplies and camp or do you have to pay for camping? How do spectators usually get from one stop to the other? Any advice/extra info would be much appreciated, thanks! 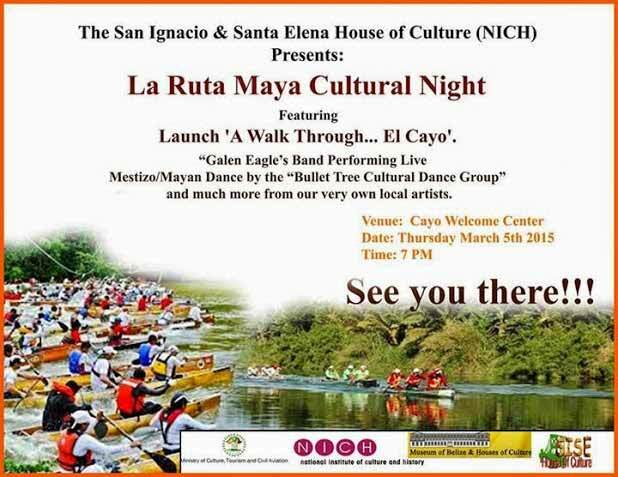 The SISE House of Culture is having their annual LRM Cultural Night this Thursday at the Cayo Welcome Center. They'll have a special cultural presentation for the event. The Galen Eagles Band will be performing, as will the Bullet Tree Cultural Dance Group. It all starts at 7:00pm. Government telephone company team at 2012 race. The annual Ruta Maya Canoe Race brings together professional and amateur paddlers from Central and North America and Europe every March. 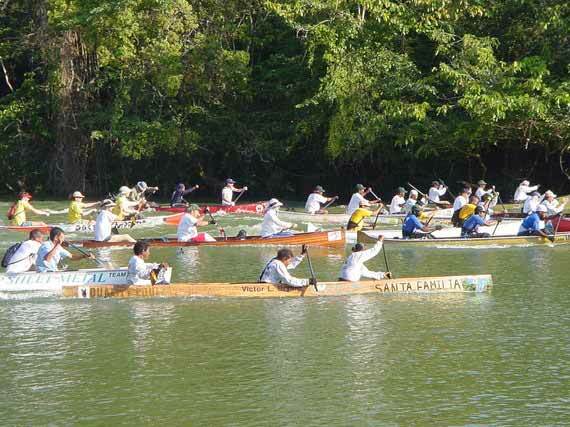 The annual La Ruta Maya Belize Endurance Canoe race is the longest race of its kind in Central America. One hundred and seventy miles of paddling on the Belize River over the course of 4 days. The race gets underway in San Ignacio Town Cayo District just under the Hawksworth Bridge. Between 90 and 100 teams from Belize, U.S.A., Canada, Japan, the U. K. and other countries participate. Starting at 7 in the morning, the paddlers are challenged by rapids, low areas that require them to physically carry their canoes for short distances as well as winds as they near the Caribbean Sea. The start of the race sees hundreds of locals and visitors trooping to the banks of the Macal River – a beautiful sight in the early morning mist. A local marimba band is in attendance and paddlers take last-minute practice runs and swap tips about tricky spots on the river to avoid. Everyone is welcomed, from pros intent on winning to those just wishing to be in the race for recreation. The race was the idea of a local fruit juice company, Cayo Tropical Fruits that sponsored and organized the race from its inception. But in 2014 on the 16th anniversary of the race, it fell under the patronage of the local beer monopoly, Belikin. Canoe teams are sponsored by various businesses and educational institutions. The winning teams are the best trained and equipped. Kevlar appears to be the material of choice for canoes. But many canoes are carved or made from exotic hardwoods. The La Ruta Maya River Challenge has now become a major public and tourist attraction especially as March 9th Baron Bliss Day is a Public and Bank Holiday. The race rivals other Belize Sailing events such as the Baron Bliss Harbour Regatta. The event is open to the general public and everyone is invited to to enjoy fun filled days with food, live entertainment, games, prizes and of course close up of views of the action as the race passes populated areas. The annual Ruta Maya Belize Canoe Race brings together professional and amateur paddlers from Central and North America and Europe every March. The annual Ruta Maya Canoe Race brings together professional and amateur paddlers from Central and North America and Europe every March. 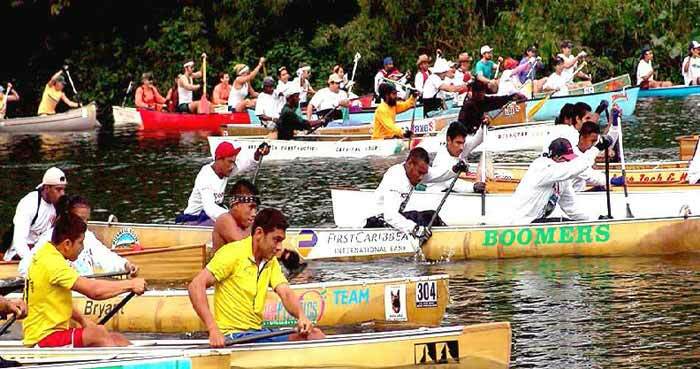 All teams consist of three members who must be aboard the canoe at the start of the race and no substitutions are allowed once the race has started. The race is divided into the following classes. Male, Female, Mixed (male and female), Masters (over 40 years of age) and may include mix of male and female. Open canoes with a maximum length of 20 feet constructed of any material and by any method are allowed to compete. For safety reasons the canoe must provide at least 25 pounds of buoyancy when swamped. Propulsion is manual, human muscle powered with single blade paddles only. Timing for determining a winner is on an elapsed time basis. Many locals and tourists intercept the race along strategic observation points on the river bank. Villages along the route, such as Burrel Boom hold fairs and open markets with music and other entertainment during the race. The country’s first colonial settlements started on the banks of the Belize River as this was the main means of transport in days past. The Cayo Boats that steamed up and down the river between San Ignacio and Belize City on the Caribbean Sea would take up a week for a journey up the river – stopping at various settlements to trade or let off and pick up passengers. The river also served to transport the many thousands of exotic hardwood trees such as mahogany which were exploited by the British colonizers. The trees were cut down, then floated down the river and trapped by heavy chains called “booms” where they were collected before continuing their journey to Belize City to be sent off to England. One such place was Burrel Boom, a village of great beauty in the Belize District. Awards to the racers are issued at the official ceremonies which take place around midday in Belize City which is the final leg of the race. All the winners are presented with cash and trophy awards and honored for their hard work. Day 1 – Race starts in San Ignacio, Cayo District (at 7:00 a.m.); ends in Banana Bank, Belize District. Day 2 – Race starts in Banana Bank (at 6:30 a.m.); ending in Double Head Cabbage, Belize District. Day 3 – Race starts in Double Head Cabbage (at 8:00 a.m.); ending in Burrell Boom, Belize District. Day 4 – Race starts in Burrell Boom (at 9:00a.m. ); ending at Belchina Bridge “Finish Line” in Belize City. Rachel - yes, you can do this on a budget. Take the boat to Bz City, then bus to San Ignacio, Bermudian Landing, Banana Bank (near Belmopan) or Burrel Boom. Bring your camping supplies and just camp out. There will be lots of people camped at all the stops en route. Do it! It will be HUGE fun! 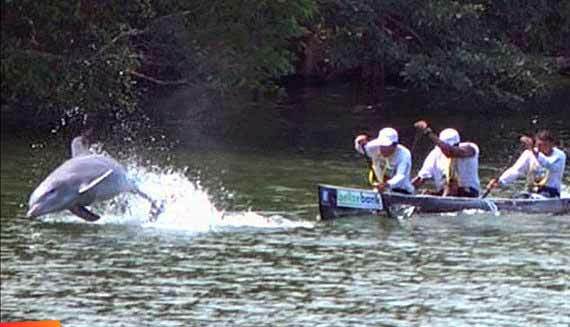 Once again, one of the coolest events in all of Central America, and definitely one of the most interesting canoe races in the world is about to take place in Belize. 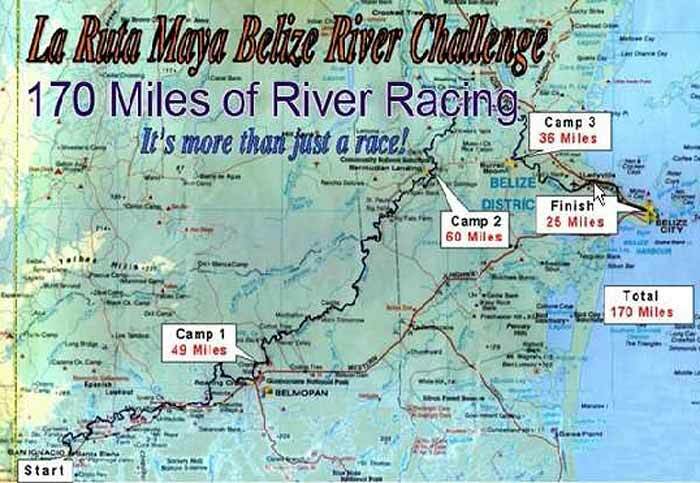 Yes folks, it’s time for the annual La Ruta Maya Belize River Challenge. Since its humble beginnings in 1998, the La Ruta Maya has grown to become one of the most exciting and popular events in Belize. Worldwide, it’s ranked 40th on “Peak Races’ 100 Toughest Races in the World”. This year, just after daybreak on March 6, over eighty teams of plucky paddlers will leave San Ignacio Town to begin the gruelling 180-plus mile race to Belize City!! The 2015 La Ruta Maya kicked off this morning. More pictures here. Video here. They had a fun Cultural Night at the CWC last night. Start of Day 1 of the Annual La Ruta Maya River Challenge.